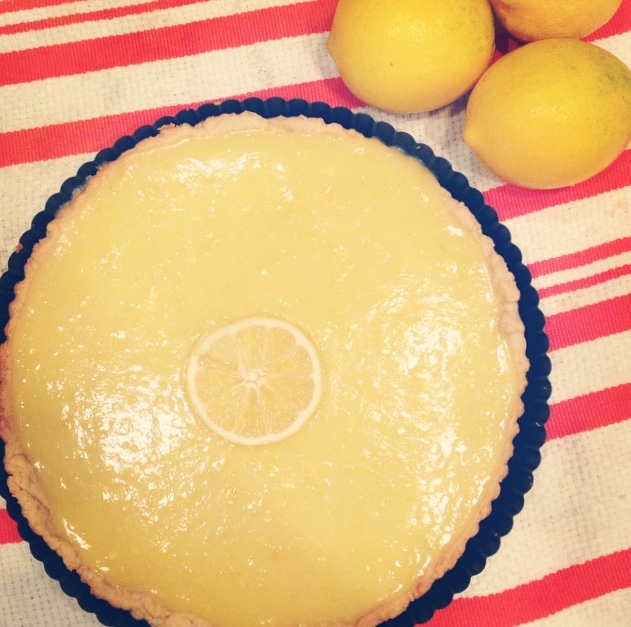 With fresh lemons off a friends tree in LA, there seemed no better time to make a lemon tart. There are numerous recipes but of course I decided on this one by Ina because she has never failed me. The crust however was a bit too time intensive, so I substituted with Williams-Sonoma’s recipe for Basic Tart Dough. The recipe for this combination is below. Don’t worry mom (lemon curd is her favorite), I will make it for you in two weeks when I am home for Thanksgiving!! Preheat oven to 350 degrees. In a small bowl, stir together the egg yolk, water and vanilla; set aside. Stir together the flour, sugar and salt in the mixer bowl. Using the flat paddle attachment, add the butter and beat on medium-low speed until the texture resembles coarse cornmeal, with butter pieces no larger than small peas. Add the egg mixture and beat just until the dough pulls together. To roll out the dough, on a lightly floured board, flatten the disk with 6 to 8 gentle taps of the rolling pin. Lift the dough and give it a quarter turn. Lightly dust the top of the dough or the rolling pin with flour as needed, then roll out until the dough is about 1/8 inch thick. Place dough in a tart pan and bake for 20-25 minutes. Remove the zest of the lemons with a zester, being careful to avoid the white pith. Squeeze the lemons to make 1/2 cup of juice and set the juice aside. Add the sugar to the small zest bowl and mix together. In the bowl of an electric mixer fitted with a paddle attachment, cream the butter with the sugar and lemon zest. Add the eggs, 1 at a time, and then add the lemon juice and salt. Mix until combined. Pour the mixture into a 2-quart saucepan and cook over low heat, stirring constantly, until thickened, about 10 minutes. The lemon curd will thicken at or just below a simmer. Remove from the heat. Fill the tart shell with warm lemon curd and allow to set at room temperature. This entry was posted in baking, cooking and tagged baking, Lemon curd, Lemon Tart. Bookmark the permalink. hooray- it is beautiful and I can’t wait to taste it!! yay the lemons made it back! !